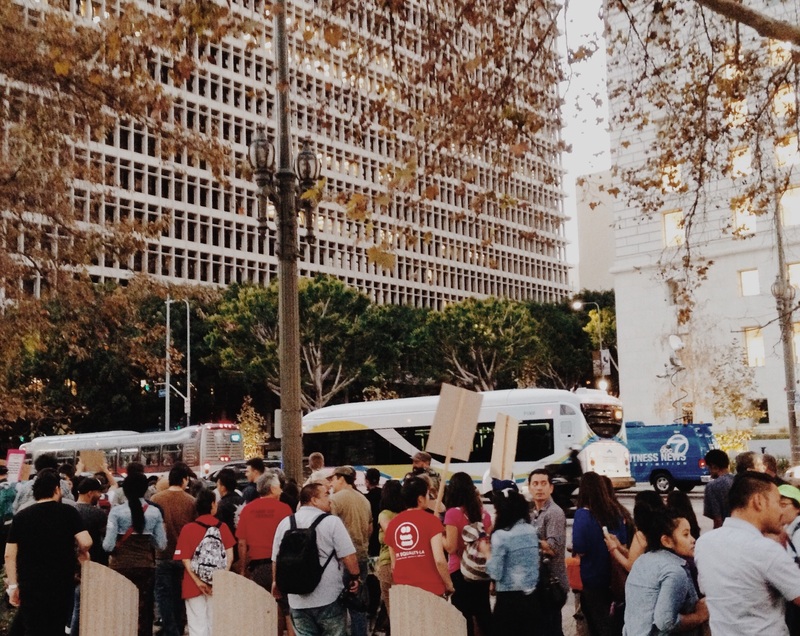 As the sun began to set in Los Angeles, the sound of people chanting, “hands up, don’t shoot” resounded in front of the Federal Courthouse on Spring Street. It has been just two days since the Ferguson grand jury decided to not indict Darren Wilson, but marches and demonstrations have become an almost familiar sight in Los Angeles, with drivers honking to show their support. Protesters from all over L.A. stood in front of the courthouse with signs calling for justice for victims of police brutality. Some non-black protesters acknowledge that they will never understand the experiences black people go through, but Evelyn Yoshimura, the Community Organizing Director at Little Tokyo Service Center, can sympathize. Yoshimura grew up in a community of Japanese and blacks, and has witnessed the way police treated minority residents in her area, going so far as to blindly accuse kids of being in an Asian gang. While some of the protestors were turning out for their very first walk along the picket line, other protestors arrived with long histories of fighting for social justice. Owen Edinger, who grew up in China and was in Beijing during the Tiananmen Square protests, moved to the United States to be in a country that “didn’t commit horrible crimes against their own people.” Edinger came to protests in support of Ferguson because he has witnessed the damage done by authorities with unchecked power. “When something like this happens, it is a sign of outright racism and outright corruption in the system,” said Edinger. Many gave speeches in front of the courthouse as individuals listened, chanted and clapped. Some of these speakers included a city council candidate’s daughter, a member of the Revolution Club and a member of Radical Women. They all discussed the importance of coming together in protest and opposing police brutality. A member from the Coalition for Community Control Over the Police mentioned Damon Turner. He is a member of the organization Black Lives Matter, and was arrested this morning due to protesting. The crowd applauded as the speaker honored Turner’s efforts. LAPD officers escorted protesters down the street as they joined a crowd chanting and marching in front of LAPD Headquarters. This multimedia story was produced in collaboration with USC’s Annenberg School of Journalism. I produced this along with Heidi Carreon. I am responsible for the video and editing/helping with text.